By Sean Michael Wilson and Michiru Morikawa. ​Eerie traditional Japanese stories of ghosts, mystery and magic retold in a graphic novel format. Over one hundred years ago, the writer Lafcadio Hearn gathered and translated into English a selection of traditional Japanese ghost/mystery stories. They were published as Kwaidan: Stories and Studies of Strange Things. In this new graphic novel, acclaimed manga creator Sean Michael Wilson retells six of these stories. All of them are very well known in Japan, where ghosts and demons are often called yokai,meaning "the mysterious and weird." Today these stories find expression mostly in movies and manga, but they remain rooted in the traditional ghost stories of the Edo era known as kaidan, which means "recited narrative of strange, mysterious, rare, or bewitching apparitions." The book was nominated for the prestigious EISNER AWARD in the USA. 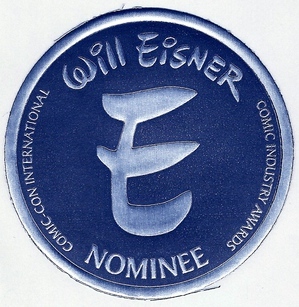 This is my first time to get nominated for an Eisner (though I got a Harvey Award nomination once already, but the Eisner is probably the top award in the USA for comics/graphic novels). I'm very pleased. 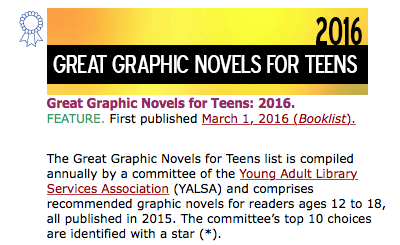 The 'Young Adult Library Services Association' are: "...a national association of US librarians, library workers and advocates whose mission is to expand and strengthen library services for teens, aged 12-18." Sounds good to me. Get a copy for your library! “THE FACELESS GHOST is a lot like that SCARY STORIES TO TELL IN THE DARK anthology that made us all pee ourselves in grade school, except with Japanese demons, ghosts, and goblins. Some of the stories are creepy. Some of them are scary. Some of them are disturbing. And one, a story about a samebito, was actually quite sweet and charming. - 4 out of 5 stars, Nenia Campbell, Librarian. “This certainly proves to be an intriguing and charming tale. Saying that a book of the macabre is charming might seem a bit odd, but the visual styling is simply amazing…Like many folk tales of other cultures, there is usually a nice moral tale or allegory at play; be it being about honesty, greed, loss, love, or playing with powers one shouldn’t. This wonderful compilation highlights some of these themes beautifully and unlike modern horror which can serve to repulse a reader, leaves them rather with a creepy, unsettling, and eerie feeling.